Widely naturalised in the temperate regions of southern Australia (i.e. in the coastal and sub-coastal districts of central and southern New South Wales, in Victoria and Tasmania, in many parts of southern South Australia and in the coastal districts of south-western Western Australia). Also sparingly naturalised in the cooler sub-coastal districts of south-eastern Queensland. Naturalised overseas in New Zealand (Weeds of Australia Biosecurity Queensland Edition). Per reviewer Ron Vanderhoff: "Rhamnus and Frangula are closely allied Genera. Our native Frangula california, F. purshiana and F. rubra were ascribed to the genus Rhamnus until recently. These native Frangula species are common components through much of the California floristic province. In interpreting this question, I am uncertain whether this is significant. The ability and success of our native Frangula species may infur a similar success for this non-native species." Screener response: I am not sure how this changes the answer to the question, but I have pasted the reviewer comment here for information. Widely naturalised in the temperate regions of southern Australia (i.e. in the coastal and sub-coastal districts of central and southern New South Wales, in Victoria and Tasmania (Zones 7a-9b), in many parts of southern South Australia and in the coastal districts of south-western Western Australia) (Zones 9a-12b). Also sparingly naturalised in the cooler sub-coastal districts of south-eastern Queensland. Naturalised overseas in New Zealand (Weeds of Australia Biosecurity Queensland Edition). These overlap with California's main zones of concern (Zones 5a-10b). Noxious weed in Iowa (USDA PLANTS). Italian buckthorn (Rhamnus alaternus) is regarded as an environmental weed in Victoria, Tasmania, South Australia and Western Australia, and was recently listed as a priority environmental weed in four Natural Resource Management regions. This species is a particularly serious environmental weed in south-eastern Australia, where it has escaped into native vegetation and formed large naturalised populations. Italian buckthorn (Rhamnus alaternus) is possibly of most concern along the south coast of Victoria, where it is seen as a very serious threat to one or more vegetation formations. For example, it is highly invasive in coastal dune scrub vegetation and coastal alkaline scrub vegetation and is a significant weed in threatened coastal moonah woodlands in this state. It also appears on several local and regional environmental weed lists in Victoria (e.g. in the Shire of Yarra Ranges, Surf Coast Shire, Moyne Shire, Mornington Peninsula Shire and in the Geelong region) and is classed as a major environmental weed in Mornington Peninsula National Park. In South Australia, Italian buckthorn (Rhamnus alaternus) is regarded as posing a threat to Adelaide's biodiversity. It is a common invasive garden plant in the greater Adelaide region and also occurs in coastal dunes and inland wooded areas in other parts of the state. It also appears on local environmental weed lists (e.g. in the City of Mitcham and the City of Tea Tree Gully) and in conservation areas (e.g. Marino Conservation Park, Belair National Park and Onkaparinga River Recreation Park) in this state. 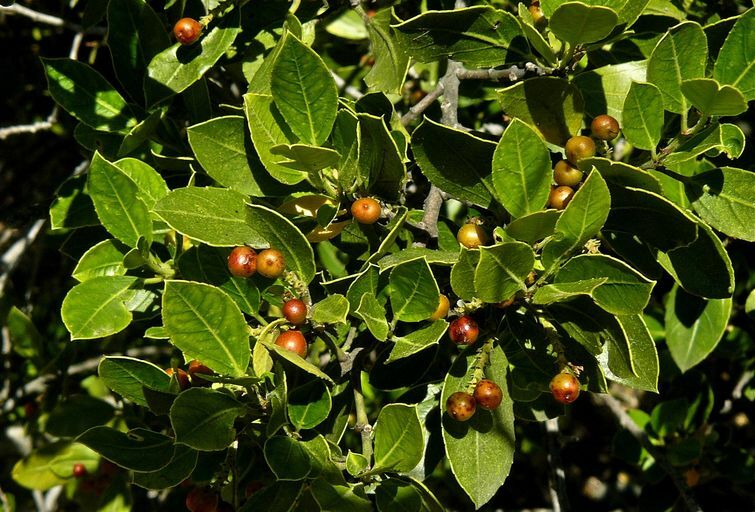 Italian buckthorn (Rhamnus alaternus) is also becoming a major weed in waterways in south-western Western Australia and was recently ranked as a moderately important environmental weed in the Environmental Weed Strategy for Western Australia. While it currently has a relatively limited distribution it is seen as a potentially a serious weed of disturbed bushland. Unlike in south-eastern Australia, it is more of a problem along rivers and creeks in this part if the country. It has been reported from Rottnest Island, on the Swan River cliffs, in the Helena Valley and at Harvey. In New Zealand, Italian buckthorn (Rhamnus alaternus) is a weed of coastal areas, and is especially prominent on exposed cliff-faces on offshore islands (Weeds of Australia Biosecurity Queensland Edition). Italian buckthorn (Rhamnus alaternus) is also becoming a major weed in waterways in south-western Western Australia and was recently ranked as a moderately important environmental weed in the Environmental Weed Strategy for Western Australia. While it currently has a relatively limited distribution it is seen as a potentially a serious weed of disturbed bushland. Unlike in south-eastern Australia, it is more of a problem along rivers and creeks in this part if the country. It has been reported from Rottnest Island, on the Swan River cliffs, in the Helena Valley and at Harvey (Weeds of Australia Biosecurity Queensland Edition). Qaderi, M. M., Clements D. R., & Cavers P. B. (2009). The biology of Canadian weeds. 139. Rhamnus cathartica L.. Canadian Journal of Plant Science. 89, 169–189. Cal-IPC Red Alert 2008, and was targeted for weed risk assessment in California, but has not yet been conducted at the time of this writing. Invasive in Australia (California Invasive Plant Council). Is a Mediterranean species (Jepson) that would be well-adapted to California's Mediterranean climate. Grows best in Zones 8a-9b (Dave's Garden), or 7-10 (Plant Lust). A weed of coastal environs, riparian vegetation, grasslands, open woodlands, dry sclerophyll forests, rocky outcrop vegetation, plantations, disturbed sites, waste areas and roadsides in temperate regions (Weeds of Australia Biosecurity Queensland Edition). Rhamnus alaternus is commonly used in reforestation programs in the Mediterranean, due to its fecundity and ability to survive in xeric environments (Gulias et al. 2004 - Global Invasive Species Database). Jepson Flora Project (2015). The Jepson Herbarium Online. A large shrub or small tree growing up to 5 m tall. In coastal New Zealand, it forms dense stands that nothing will grow underneath. In southeastern Australia, Italian buckthorn (Rhamnus alaternus) crowds out and replaces native species in the shrub layer, and its dense growth prevents light reaching ground-cover plants. This species is quick growing and is particularly invasive in coastal woodlands and dune systems. Because its growth rate is faster than most native shrub and tree species, Italian buckthorn (Rhamnus alaternus) quickly dominates the vegetation out-competing sub-canopy species in all forest types, and infiltrating the canopy of lower scrubby vegetation types. It can form dense stands and may eventually cause the exclusion of all other vegetation (Weeds of Australia Biosecurity Queensland Edition). The shrub forms dense thickets that shade out native plants and lead to species-poor stands (GCW). Rhamnus typically forms thickets of 2-3m tall multi-stemmed shrubs on steep coastal slopes with shallow soils, and copses of c. 15m trees on more gentle slopes with deeper soils (Fig. 3). Plant regeneration is prevented in the understorey of such stands (Fig. 4), except around their edges or in light gaps. The main impact therefore, is the creation of hostile conditions for plant growth, which is probably caused by rhamnus producing too much shade. Rhamnus has demonstrated the ability to smother treescapes and rank pasture in a short period of time (Rhamnus alaternus environmental weed on Motutapu and Rangitoto Islands Auckland). Fromont, M. L. (1997). Rhamnus alaternus environmental weed on Motutapu and Rangitoto Islands Auckland. Tane. 36, 57–66. It tolerates drought, salt spray and can survive intense fire as it has lignotuber, from which it can regrow (Declared Plant Policy: Italian Buckthorn (Rhamnus alaternus)). Has a favorable fire performance rating (Diablo Fire Safe Council) and has some fire resistance (Sunnyside Nursery). However, it is not noted as promoting fire or changing fire regimes, and this defaults to a "no" answer. Hunter, H. Ian (2015). Declared Plant Policy: Italian Buckthorn (Rhamnus alaternus). Diablo Fire Safe Council (0). Diablo Fire Safe Council. Rhamnus has demonstrated the ability to smother treescapes and rank pasture in a short period of time. Domestic stock graze rhamnus and prevent the plant from establishing on farmland. In Auckland, rabbits occur in high numbers on Motutapu Island and are pests themselves as they browse young native trees. However, they also eat rhamnus seedlings, and therefore provide a temporary benefit to the restoration programme of the island (Rhamnus alaternus environmental weed on Motutapu and Rangitoto Islands Auckland). An exhaustive Google/Google Scholar search did not reveal any additional information about impacts to grazing systems, or toxicity (although unlikely, given lack of evidence and wildlife that eat this plant) and this defaults to a "No" answer. A large shrub or small tree growing up to 5 m tall. In coastal New Zealand, it forms dense stands that nothing will grow underneath. In southeastern Australia, Italian buckthorn (Rhamnus alaternus) crowds out and replaces native species in the shrub layer, and its dense growth prevents light reaching ground-cover plants. This species is quick growing and is particularly invasive in coastal woodlands and dune systems. Because its growth rate is faster than most native shrub and tree species, Italian buckthorn (Rhamnus alaternus) quickly dominates the vegetation out-competing sub-canopy species in all forest types, and infiltrating the canopy of lower scrubby vegetation types. It can form dense stands and may eventually cause the exclusion of all other vegetation (Weeds of Australia Biosecurity Queensland Edition). The shrub forms dense thickets that shade out native plants and lead to species-poor stands (GCW). Rhamnus typically forms thickets of 2-3m tall multi-stemmed shrubs on steep coastal slopes with shallow soils, and copses of c. 15m trees on more gentle slopes with deeper soils (Fig. 3). Plant regeneration is prevented in the understorey of such stands (Fig. 4), except around their edges or in light gaps. The main impact therefore, is the creation of hostile conditions for plant growth, which is probably caused by rhamnus producing too much shade (Rhamnus alaternus environmental weed on Motutapu and Rangitoto Islands Auckland). Italian buckthorn has been used as a hedge and could therefore pose a major physical barrier to people and animals where it establishes (Declared Plant Policy: Italian Buckthorn (Rhamnus alaternus)). Global Compendium of Weeds (GCW), Hawaiian Ecosystems at Risk (HEAR) project, Pacific Island Ecosystems at Risk (PIER) (2007). Invasive species information for Hawaii and the Pacific: Global Compendium of Weeds (GCW). This species reproduces mainly by seed, however plants will re-shoot vigorously from the base whenever they are damaged (Weeds of Australia Biosecurity Queensland Edition). It is fast growing and resprouts vigorously from the base after damage (GCW). It coppices vigorously after being felled or burnt (Zohary 1962 - Rhamnus alaternus environmental weed on Motutapu and Rangitoto Islands Auckland). It tolerates drought, salt spray and can survive intense fire as it has lignotuber, from which it can regrow (Declared Plant Policy: Italian Buckthorn (Rhamnus alaternus)). Resprouting after damage in a woody species and lignotubers warrant a "Yes" answer. An exhaustive Google/Google Scholar search did not reveal any additional information about production of new plants from fragments, and this defaults to a "no" answer. This species reproduces mainly by seed, however plants will re-shoot vigorously from the base whenever they are damaged (Weeds of Australia Biosecurity Queensland Edition; Rhamnus alaternus environmental weed on Motutapu and Rangitoto Islands Auckland). Fruits are abundantly produced (GCW). Produces many viable, long-lived and well dispersed seeds (Weedbusters). Female trees yield heavy crops of globose fruit (up to 3000 fruit per m2) from October to February (Fromont 1995 - Rhamnus alaternus environmental weed on Motutapu and Rangitoto Islands Auckland). Seed production has been reported as very variable; however fruit production per plant has been estimated at approximately 11,000 berries per plant (Declared Plant Policy: Italian Buckthorn (Rhamnus alaternus)). The longevity of the seed bank is unknown (Declared Plant Policy: Italian Buckthorn (Rhamnus alaternus)). The fruit ingestion of R. alaternus by frugivorous birds results in the deposition of clean seeds (without pulp) but enclosed within endocarps (Bas et al. 2002). Endocarps generally release the seeds when dry, but some endocarps never open, preventing seedling emergence (Bas 2001). Pulp covering seeds not only decreases the proportion of seedlings emerging but also slows emergence. In R. alaternus in another study (Barnea et al. 1991) and in R. cathartica (Archibold et al. 1997) pulp-covered seeds never germinated, indicating the presence of inhibitors in the pulp (Izhaki and Safriel 1990; Barnea et al. 1991), interference with water absorption by the seeds (Debussche 1985), or harmful organisms that grow in the pulp (Traveset and Willson 1997 - Exclusive frugivory and seed dispersal of Rhamnus alaternus in the bird breeding season). Suitable conditions including temperature and humidity are necessary for seed germination, emergence and seedling survival. The fruit is a small drupe (diameter < 1 cm) which bears two or three seeds covered by an endocarp that opens when the fruit pulp is removed. The endocarp opened just 24h after the fruit pulp was removed (Seed germination at different temperatures and seedling emergence at different depths of Rhamnus spp). An exhaustive Google/Google Scholar search did not reveal any additional information about time to germination after seed is released, and this question remains unanswered at this time. It seems unlikely, however, given the dormancy mechanisms for this species, that germination occurs rapidly, unless birds eat seeds as soon as they are produced. Thus, this defaults to a "No" answer. Bas, J. M., Pons P., & Gomez C. (2006). Exclusive frugivory and seed dispersal of Rhamnus alaternus in the bird breeding season. Plant Ecology. 183, 77–89. Aou-ouad, H. El, Medrano H., Lamarti A., & Gulías J. (2014). Seed germination at different temperatures and seedling emergence at different depths of Rhamnus spp. Central European Journal of Biology. 9, 569–578. The taxon enters its reproductive phase in three years and has a fast growth rate (height increase of up to 800mm per year) (Auckland Regional Council 1999; Wotherspoon and Wotherspoon 2002; RNZIH 2004). Male plants were found to have greater growth rates than females in southern Italy (Aronne and Wilcock 1995 - Global Invasive Species Database). In Australia, flowers are produced during winter and early spring (i.e. from May to October - Weeds of Australia Biosecurity Queensland Edition). In Auckland, female trees yield heavy crops of globose fruit (up to 3000 fruit per m2) from October to February (Fromont 1995 - Rhamnus alaternus environmental weed on Motutapu and Rangitoto Islands Auckland). Fruit is a berry containing three seeds (Jepson). The seeds are often spread by fruit-eating (i.e. frugivorous) birds, especially blackbirds, and other animals. However, they may also be spread in dumped garden waste (Weeds of Australia Biosecurity Queensland Edition). Consumption/excretion: The fruits of Rhamnus alaternus are dispersed by vertebrates, which includes birds, possums and insects (e.g. ants) (Aronne and Wilcock 1994; Auckland Regional Council 1999; Gómez et al. 2003). Consumption/excretion: Rhamnus alaternus is spread when birds, possums and other animals eat the berries, distributing the seeds further afield in their droppings (The Auckland Regional Council, 1999 - Global Invasive Species Database). The seeds bear an elaiosoma and may thus be secondarily dispersed by ants (Seed germination at different temperatures and seedling emergence at different depths of Rhamnus spp). An exhaustive Google/Google Scholar search did not reveal any information about dispersal via these mechanisms, and this defaults to a "no" answer. Per reviewer Ron Vanderhoff: "A report suggests that the species may also be wind pollinated, although I could not reference the original citation. The comment is "Although largely pollinated by insects, the dry pollen of R. alaternus suggests it is also transported by wind (Aronne and Wilcock 1995)." This comment can be referenced at http://www.iucngisd.org/gisd/species.php?sc=893." Screener response: this does not apply to dispersal of seed; pollen is usually much lighter than seed, and is likely to travel longer-distances than seed. Lack of any evidence of long-distance wind dispersal means this remains a "No" at this time. May be spread in dumped garden waste (Weeds of Australia Biosecurity Queensland Edition). Spread by soil movement and dumped vegetation (Weedbusters). May therefore be spread by mud stuck to vehicles or equipment. However, per personal communication with Joseph DiTomaso, "I would answer NO to this. All plants can have seed moved in mud or soil, but this question is directed at a major pathway of movement." As such, this is scored a 'No'. Reviewed by Joe DiTomaso (UC Davis WRIC, not named in Issues), Ron Vanderhoff (CA Native Plant Society- Orange Co. Chapter, rvanderhoff@sbcglobal.net), and Irina Irvine (Santa Monica Mtns Nat’l Recreation Area, irina_irvine@nps.gov). Ron Vanderhoff comment in general: "Rhamnus alaternus is a dioecious plant. It is also a fairly common (and growing in popularity) horticultural plant. However, this situation causes some interesting considerations. Within the horticultural industry this species is almost solely represented by the selection Rhamnus alaternus 'John Edwards'. This selection originated at John Edwards Nursery in East Palo Alto, California. It was introduced in or before 1962 by the Saratoga Horticultural Foundation of California. This selection is the only taxa I have every seen for sale in California (I am the general manager at California's largest and busiest retail garden center). This selection is reported to be a male, fruitless clone. I have never seen seed set on any of these selections over the past 15 years or so, including many rather large and old examples. Nonetheless, one of the most significant infestations of this species is right here in Newport Beach at Upper Newport Bay. The species was first reported here in 1988, which appears to be the first record for CA. Since that time it has spread assertively in this area and is now a significant management concern. The plants at this Newport Beach infestation include both male and female examples and not the 'John Edwards' selection. This population is spreading rather agressively via abundant seed production. So . . . . . many of these PRE questions become complicated due to the dioecious quality of this plant and by the main (only?) plant in commerce being functionally sterile. I suspect that the PRE scoring should be based upon worse-case (male and female plants), which is the manner in which I performed my review. Nonetheless, perhaps the male-clone issue should be a consideration in any communications or recommendations re the species. I know communication and implementation discussions may be outside of the PRE score, but wanted to bring it as a topic."